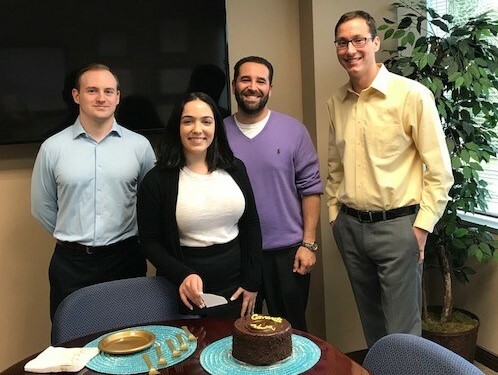 We held a little celebration last week for Client Service Associate Nadia Rullo. As you may know, Nadia is studying for the Certified Financial Planner (CFP®) designation, which normally includes six course modules, with an exam after each one, and a comprehensive exam at the end. The entire program might take one to two years, and also requires at least 4,000 hours of professional apprenticeship working under the supervision of a CFP®. Nadia is well on her way. She sailed through the exam for the first module with ease, and now starts her second module. Congratulations, Nadia! Always a good excuse for chocolate cake! Financial Tip: Don’t take our word for it. The personal finance experts at Kiplinger Personal Finance, who have been helping Americans manage their finances since 1920, explained earlier this summer why you may want to ask a CFP® to chair your financial team. CFP® professionals are held to strict ethical standards, ensuring the advice you receive is transparent and objective. No hidden fees, no hidden agendas. One Response to Congratulations, Nadia!